Big Daddy’s Signs – More Than A Sign Company, We Are Your Advertising Solutions Resource! Advertising signs are perfect for advertising any type of event, function, party, business, skill or sale. Big Daddy’s Signs specializes in all types of signage. We offer several products to enhance and promote your business needs, including banners, yard signs, and political campaign lawn signs. Our most affordable, high quality signs will help you match your message to the state-of-the-art custom signs and display solutions that will best deliver it. We design and manufacture your new signage on time and on budget. Custom made signs are commonly used in real estate, political campaigns, small business advertising, or any type of message you want to display to large amount of people. We invite you to explore our extensive range of custom printed advertising yard signs, real estate signs, car magnets, vinyl banners and political signs. Below you will find some of the many products available from Big Daddy’s Signs. To see examples of these types of signs, click on any of the images below. Corrugated Plastic Yard Signs – A beautiful and durable solution for outdoor or indoor advertising such as political signs , real estate signs or business signs. 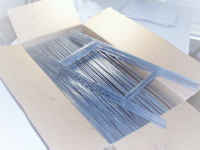 Wire Stands for Yard Signs – Heavy duty 9 gauge wire stands that fit perfectly into the corrugated plastic signs . We offer both the economical 6″ x 18″ and 6″ x 24″ stands and also large size 10″ x 30″ wire stands as well as 10″ x 30″ Heavy Duty wire stands. Banners – Our banners are top-quality, 13-oz. glossy stock which is flexible, tear resistant, and weather-proof. And since banners are portable, you can save tons on shipping over printing on rigid materials. Vehicle Magnets – Full-Color Vehicle Magnets for your business or political campaign, vehicle magnets receive hundreds of views per day. They are printed in full color and make the impact that you want. Car magnets have even become a simple and easy product for fundraisers, promoting awareness and school spirit. Aluminum Signs – Full color .040 aluminum signs provide the durability and quality needed for long-term signage.